My overflowing bookshelf as of today. Note to self: must reorganize soon. Thank you for stopping by! 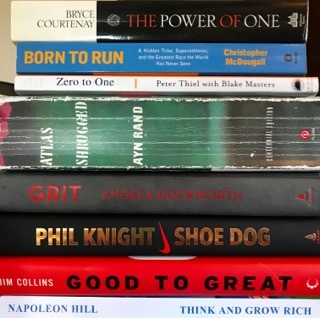 Great to have you here and I hope you enjoy this list of my favorite books that continue to inspire and motivate me personally and professionally. I wholeheartedly believe that working out your mind is as important as working out your body, and reading is my favorite form of mental fitness at the moment. My husband also loves reading and is a speed reader compared to me, but he also workouts mentally by solving math problem sets online. This is not something I'll ever understand or be able to do, but after majoring in Math, Physics and Philosophy in college, this outlet just makes sense for him from time to time. What's your favorite form of mental fitness (meditation, coloring/painting, reading, writing, etc.)? After our wedding in March, my husband and I committed to turning to books anytime we were tempted to turn on Netflix or a movie. So now after dinner we usually go for a walk around the neighborhood before cuddling up with our respective books. I've loved the new habit and although I'm often tempted to turn off my brain after a long day at work in front of the TV, I have learned to keep a variety of books handy to suit whatever mental state I'm in. Some are very scientific and physiological, while others are more light-hearted and fun. By keeping a variety of books around and organizing my bookshelf by mood and subject, I have an accessible variety to suit my mental needs that day or night. Below is the list of my top 10 favorite inspirational books. These are the ones I reference again and again whenever I need an extra push, motivation or new perspective on a problem I'm struggling with. Some are new, others old and some potentially controversial, but ultimately these books have spoken to me personally and strengthened my overall mental fitness muscles. I hope you've enjoyed some of these as well or can enjoy them someday soon. Happy reading and I hope to hear from you on what books inspire you most! 1. Unbroken by Laura Hillenbrand. My favorite quote: "Dignity is as essential to human life as water, food, and oxygen. The stubborn retention of it, even in the face of extreme physical hardship, can hold a man's soul in his body long past the point at which the body should have surrendered it. The loss of it can carry a man off as surely as thirst, hunger, exposure, and asphyxiation, and with greater cruelty." Why does this book motivate or inspire me? I tend to gravitate towards non-fiction in both movies and books, and I love any true or relatable story of overcoming hardship, particularly those requiring mental toughness and emotional acuity. And boy does this book deliver on all levels for me. Not only it is an amazing true story of a former Olympic track star who survived a plane crash while serving in WWII, spent 47 days drifting on a raft, and then survived more than 2.5 years as a prisoner of war in 3 brutal Japanese prisoner-of-war camps. Every time you think the main character, Louie, is about to catch a break, he doesn't. It's heart wrenching, nail-biting, encouraging, inspiring and incredible at every turn. If you're considering giving up, read this book and hold on to the fact that you are most certainly braver than you believe, stronger than you seem, and smarter than you think. Do not give up. Believe and keep going! Louie demonstrates just how self-fulfilling your thoughts are. If you truly believe, you will succeed. How was I introduced to this book? I came across Unbroken while perusing the NYT's best seller list in 2010, after having to relocate from Houston to NYC with my Investment Bank. After working 110-hour weeks for a full year and a summer as a financial analyst, I was looking for an inspirational story and anything outside of Excel and Powerpoint. This book definitely did the trick then and continues to be an inspiration for me today. My favorite quote: "The art of competing, I’d learned from track, was the art of forgetting, and I now reminded myself of that fact. You must forget your limits. You must forget your doubts, your pain, your past. You must forget that internal voice screaming, begging, “Not one more step!” And when it’s not possible to forget it, you must negotiate with it. I thought over all the races in which my mind wanted one thing, and my body wanted another, those laps in which I’d had to tell my body, “Yes, you raise some excellent points, but let’s keep going anyway . . ."
Why does this book motivate or inspire me? I had not known anything about the evolution or history of Nike before reading this and was absolutely amazed by Phil's ingenuity, partnerships, fortitude, passion and foresight. I loved that he was able to turn his love of running into a game-changing and industry altering empire. I was also amazed to learn that the notorious Nike swoosh logo only cost the company $35 when in 1971, Phil hired a graphic design student to come up with a logo. Overall, the book was awesome and emphasized that by pursuing your passion full time it does not have to be simply a 'passion project or hobby' as some people call it, but can truly be a 'passion profession' if you commit yourself 110% as Phil did. How was I introduced to this book? When I'm looking for a new book, I will sporadically put keywords into Amazon books’ search function and came across 'Shoe Dog' after searching for books on the topic of ‘sports, risk, struggle and success’. Sometimes this approach does not work out so well, but this time it did. My favorite quote: "Do not let your fire go out, spark by irreplaceable spark in the hopeless swamps of the not-quite, the not-yet, and the not-at-all. Do not let the hero in your soul perish in lonely frustration for the life you deserved and have never been able to reach. The world you desire can be won. It exists.. it is real.. it is possible.. it's yours." Why does this book motivate or inspire me? This book is ever evolving for me. No matter how many times I reread it in its entirety (which is a very long and dense ~1200 pages) or piecemeal, I uncover a new appreciation for the writing itself and meaning to me. I unveil new layers every time and appreciate Rand's exploration of the role of man's mind in existence. I have to reread every sentence a few times and it engages my academic love and dissection of Philosophy as I studied it in college at Colgate. This book makes me question myself and how I'm existing in the world today, it makes me want to be the best version of myself and encourage those I surround myself with to do the same. It's intense and not a light read by any means, but was life-changing for me, my husband, sister and many others in my life, so I definitely have a sweet spot for its undoubtedly controversial yet inspiring content. How was I introduced to this book? My older sister (by 17 months) was majoring in Philosophy and Econ at Columbia where she was introduced to the philosopher Ayn Rand. She told me to read Rand's books The Fountainhead first and then Atlas Shrugged. I did just that and fast forward nearly a decade later, Atlas Shrugged actually connected my husband and I, who searched an online dating website I was on in 2013 for any women who mentioned Atlas Shrugged in their profile. I did and here we are! Why does this book motivate or inspire me? I have for a long time searched for a word to describe myself. Throughout my career and in professional reviews I usually got 'scrappy', 'determined' or 'machine-like'. But 'grit' seems most fitting so far, encapsulating my ability to balance perseverance and passion. This book just made sense to me, it spoke to what makes me tick and confirmed that in leveraging my grit I can be incredibly successful as I embark on my building my own company. It can get a bit too research-driven at times, but overall is insightful and encouraging. How was I introduced to this book? I heard about Grit on a few podcasts within the same week and decided to check it out myself. Glad I did! My favorite quote: "Always listen to yourself, Peekay. It is better to be wrong than simply to follow convention. If you are wrong, no matter, you have learned something and you will grow stronger. If you are right, you have taken another step toward a fulfilling life...Always you should go to the source, to the face of the rock, to the beginning. The more you know, the more you can control your destiny. Man is the only animal who can store knowledge outside his body. This has made him greater than the creatures around him. Everything has happened before; if you know what comes before, then you know what happens now. Your brain, Peekay, has two functions; it is a place for original thought, but also it is a reference library. Use it to tell you where to look, and then you will have for yourself all the brains that have ever been." Why does this book motivate or inspire me? This book is uplifting, compelling, engrossing and impressive. It follows Peekay, who growing up in South Africa in the 1940s and 50s overcomes numerous setbacks and struggles in an attempt to become welterweight champion of the world. He dreams heroic dreams and along the way, learns the power of words, the power to transform lives and ultimately the power of the individual to overcome difficulties (aka 'The Power of One'). This book inspires what we'd all like to believe, that the individual, armed with the spirit of independence or 'the power of one', can prevail! It was great and I highly recommend it for anyone needing a boost. How was I introduced to this book? My sister. My favorite quote: "Brilliant thinking is rare, but courage is in even shorter supply than genius." Why does this book motivate or inspire me? This book is succinct yet effective. It describes how every time we create something new, we go from 'Zero to One', rather from I to n when we do something we already know how to do. Thiel asserts "Progress comes from monopoly, not competition" and it's fascinating to follow his logic around how to build companies that create new things. He highlights how successful people find value in unexpected places and encourages entrepreneurs to ask "What valuable company is nobody building?". We all have ideas but having valuable ideas and the courage to execute on them is a rare combination. As I started my new venture ~8 months ago, this book encouraged me to think bigger, follow my gut of something that may require a bit more explaining in the beginning because it's new, and to not stop pursuing it until I've gone from 0 to 1. Taking risks is worth it, if not simply for the learning and growth, perhaps for the potential opportunity to be the one that goes from 0 to 1, right? How inspiring is that to think about? How was I introduced to this book? My husband, who hosted Thiel at his company for a talk and encouraged me to get a signed copy of his new book, Zero to One. My favorite quote: "The Struggle is when you want the pain to stop. The Struggle is unhappiness. The Struggle is when you go on vacation to feel better and you feel worse. The Struggle is when you are surrounded by people and you are all alone. The Struggle has no mercy. The Struggle is the land of broken promises and crushed dreams. The Struggle is a cold sweat. The Struggle is where your guts boil so much that you feel like you are going to spit blood. The Struggle is not failure, but it causes failure. Especially if you are weak. Always if you are weak. Most people are not strong enough. Every great entrepreneur from Steve Jobs to Mark Zuckerberg went through The Struggle and struggle they did, so you are not alone. But that does not mean that you will make it. You may not make it. That is why it is The Struggle. The Struggle is where greatness comes from." Why does this book motivate or inspire me? Holy cannoli. This book though! The above quote is on my inspiration page because every time I read it I get chills. After working at a startup for 2 years in Silicon Valley and in witnessing my amazing husband go through the extreme high highs and low lows of building and running his company, it is indeed anything but easy. This book uncovers just how seemingly impossible it is to build a company and Horowitz is willing to get real with his readers around just how painful and awful the experience can be. He distinguishes his book from other entrepreneur advice books in his advice around how to control your own psychology and demons as a CEO and founder. He gets real and the result is inspiring, refreshing and accessible. How was I introduced to this book? My husband. Why does this book motivate or inspire me? After being repeatedly injured as a runner himself, McDougall tracks down members of the reclusive Tarahumara Native Mexican tribe in the Mexican Copper Canyons. He marvels at the tribe's ability to run ultra distances (100+ miles) at incredible speeds, without getting the usual injuries encountered by most American runners. I was captivated by the Tarahumara members themselves as well as McDougall's description of how he overcame injuries by modeling his running after the Tarahumara. It was quirky, fun, impressive and a neat perspective on the resilient power of human ability and strength of will. If you have been wanting to get back into running, this may help. A few miles doesn't seem so daunting compared to the Tarahumara 100+ mile journeys. How was I introduced to this book? I came across this gem while perusing a local NYC bookstore around 2010. Why does this book motivate or inspire me? Collins looks at a set of elite companies that made the leap from good to great and sustained those results for at least 15 years. A theme throughout the book implies that of those companies that went from good to great and were able to sustain it, they defined a narrowly focused objective and field of competency and subsequently focused all of the company’s resources toward that area of strength. This book illuminates the importance of having distinguishing and unique characteristics, and goals that go beyond a simple desire to make money. I found this book inspiring as it places on emphasis on preserving a company's core values even while tactics may change in response to a world that never stops. I wholeheartedly believe that your values and actions should be in sync, and agree that the companies that are able to harmonize their mission statement with their actions are far more successful than those that are incongruous. How was I introduced to this book? By a longtime professional mentor. My favorite quote: "Before success comes in any man’s life, he is sure to meet with much temporary defeat, and, perhaps, some failure. When defeat overtakes a man, the easiest and most logical thing to do is to quit. That is exactly what the majority of men do. More than five hundred of the most successful men this country has ever known told the author their greatest success came just one step beyond the point at which defeat had overtaken them." Why does this book motivate or inspire me? This book is truly timeless. It was first published in 1937 and based on interviews of 500 of those who history now remembers as the greatest men of the early 20th century, including Henry Ford, J.P. Morgan, John D. Rockefeller, Alexander Graham Bell, Thomas Edison, Theodore Roosevelt, Wilbur Wright, and W. Howard Taft. It is chock full of quality quotes and examples of the inevitability of encountering and overcoming obstacles on the road to success. It is definitely quirky and at times the advice seems too intangible to be worthwhile, but those interviewed are certainly allowed to be a little out there at times, so I'd recommend taking some of the advice with a grain of salt. How was I introduced to this book? It was mentioned during a Tony Robbins podcast.